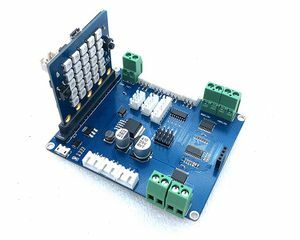 2,if you want use dc motor and servo motor, you must use must use 12V dc supply. 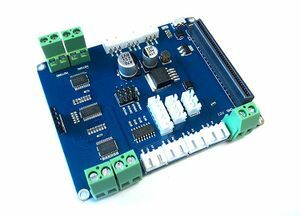 the BPI:bit robot extension board has (MOTOR A-MOTOR D)4 sets of 8 MOTOR controls, which Can control four dc motor forward and reverse rotation and eight dc motor one-way rotation. 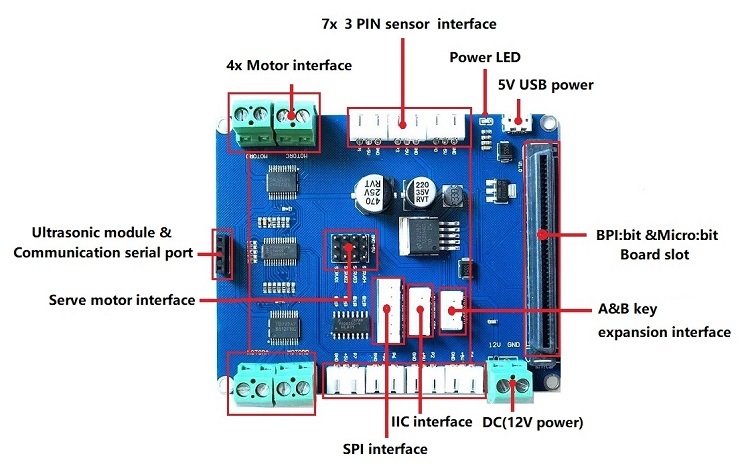 At the same time, four standard steering engine interfaces are designed on the extended version to control four servo motors at the same time.The control signal of dc motor and steering engine is chip (PCA9685) extended by the IIC bus interface. 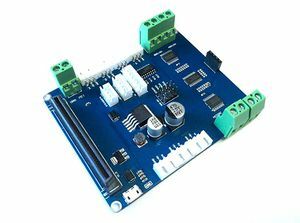 The motor interface use the extended PWM interface, which does not conflict with the sensor interface,Not use BPI:bit board resource valuable digital IO interface.At the same time, IIC bus supports address selection and can be used by multiple devices simultaneously.Dc motor drive circuit is designed with TB6612 dual-h bridge drive, and servo motor is designed with optocoupler isolation circuit to ensure the safety of the extended board and BPI:bit development board. However, due to component characteristics, the rated total current of dc motor and steering engine should not exceed 2A, and the power adapter should be equipped with 12V/3A dc power supply. A set of ultrasonic interfaces is designed at the bottom of the extended version, which USES a pin as, and can also be configured as a communication serial port (not a debug serial port).There are a total of 7 sets of 3 PIN base on both sides of the board, corresponding to the 3P interface socket of standard sensor designed for user convenience to carry out custom extension.At the same time, another set of 3P, 4P and 6P sockets are designed in the middle right of the extended version, in which the 3P socket is the extension BIT board button, which can be triggered by signals to achieve the purpose of simulating manual operation of keys.The 4P socket extends the interface for the IIC bus, because its features can involve more devices.The socket of 6P is the SPI bus extension interface of BIT board, which is also reserved for user's choice. This page was last edited on 28 November 2018, at 22:59.